Until Tasmanian Bill Lark had a word with his local MP in 1992, distilling spirits was only legal for Australia's major operators – though few remained. That word was well received, federal legislation soon changed, and within five years Lark's first small-batch whisky was ready. Others followed his lead, and Tasmanian whisky is now recognised among the world's best. Craft distillers slowly appeared on the mainland, though in Victoria there was little in the public eye until five years ago. Since then, numerous distilleries around the state have reached commercial production, and often opened to the public. Another opens its doors on Wednesday, and several more are on the way. Gin is the focus for many young Victorian distilleries. It's been on trend globally and, unlike whisky, doesn't require ageing, so newcomers can get a return on their investment sooner. Gin also lends itself to distinctive flavour and even colour variations by diverging from the botanicals traditionally used. Most gin-makers are using native ingredients, from lemon myrtle to ants, creating unique products appreciated locally and, increasingly, internationally. Whether it's gin or other spirits, Victorian distilleries are embracing local ingredients and conditions, sometimes leaning local with their products' names and, largely free from Old World rules, trying new techniques. Get into the spirit with a taste of, and perhaps a visit to, these pioneers. "We were just going to attempt to make a nice whisky and have a little cellar door," says Russ Watson, who established this distillery with his wife, Lorelle Warren, two years ago. 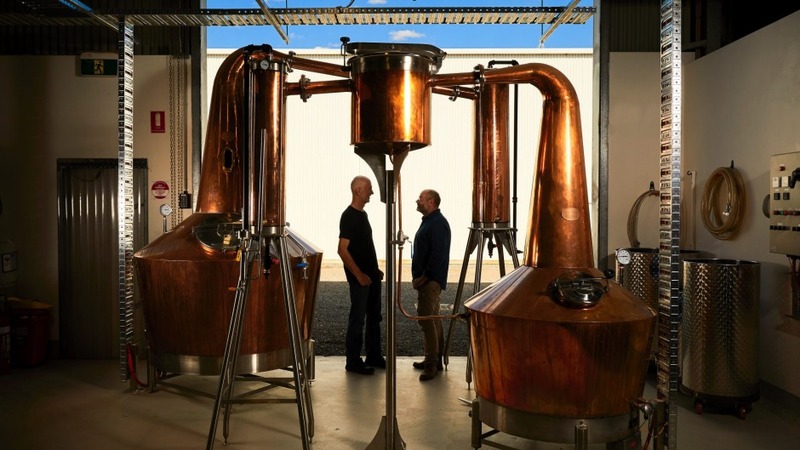 That ambition has grown somewhat: Bellarine Distillery's first commercial product, Teddy & the Fox gin, became available late last year, and The Whiskery tasting room and cafe-bar opens on Anzac Day. That "nice whisky" will keep maturing for another year or two. As black cockatoos screech overhead, and a galah spins on The Whiskery's rotating vent, Watson reveals that his citrusy gin's botanicals include lemon myrtle. In future, he hopes to harvest it from the distillery's surrounding acres, where many old fruit trees already grow. "There's heritage apples and some beautiful fig trees, so we intend to do a few blends using stuff off the property," says Watson. He also plans to grow juniper, gin's essential ingredient. There's a genuine, local feel about Watson's vision, from the rusty old shed transformed into the distillery's public space, to the gin's backstory. Bill Lark, one of many in the distilling community who have helped out, came by as a fox dashed from the woodshed, chased by Watson's dog, Teddy. This episode is whimsically captured on the label of the gin, which the proud distiller says has "gone nuts." 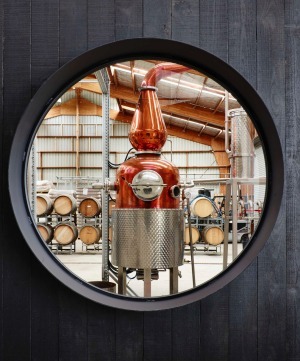 This Mornington Peninsula distillery was established by Wayne Klintworth and Bob Laing in 2009. The following year, while their brandy aged, other Bass & Flinders products such as gin and vodka became available, including at their cellar door. After Laing's unexpected death in 2016, Klintworth passed his knowledge on to his daughter, Holly, who is now head distiller. All Bass & Flinders products are driven by the "desire to work with local produce," says Holly Klintworth, particularly the peninsula's wine grapes – even their white spirits, traditionally distilled from grains or potatoes, are grape-based. Nearby farms provide other key ingredients: the seasonal Truffle Gin, for example, returns in June, after the first 2018 harvest up the road. Western Australia's Wooleen Station deliver indigenous ingredients including mulla mulla, purple vetch flowers, native lemongrass and, most unusually, ants. These insects' alarm pheromones are Angry Ant Gin's hero ingredient, imparting a subtle flavour like squashed ants' distinctive scent to its complex profile. 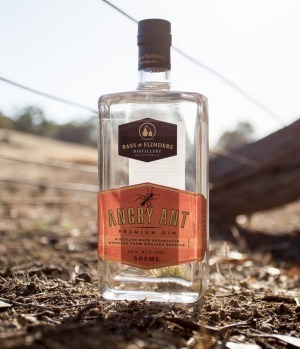 'We set out to make a native Australian gin that reflected the flavours of the Aussie outback," says Klintworth, adding that the only non-native ingredient in Angry Ant is juniper. 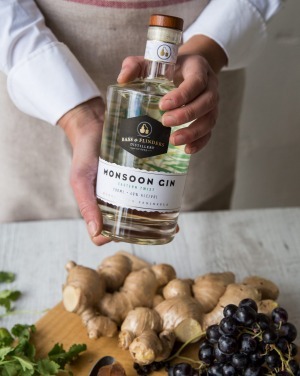 All Bass & Flinders gins, bar the Asian-influenced Monsoon, include native botanicals. From the Sheerwater vodka's Cape Schanck rainwater to Ochre, that aged brandy's name, every bottle has an Australian story. 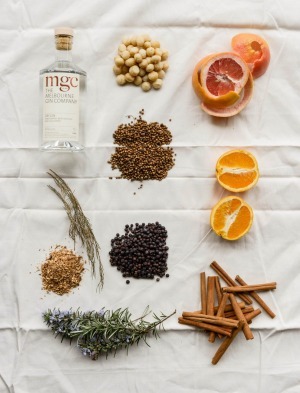 Originally intending to make tonic water that did justice to their favourite gins, Cameron Mackenzie and fellow wine-industry veteran Stuart Gregor soon decided that making gin was more their style. They launched Four Pillars in 2013 with a third partner and, after initially working out of a friend's winery, moved to their Yarra Valley premises two years later. This large, stylish public space rivals its major wine-producing neighbours. Four Pillars' first release, Rare Dry Gin, is inspired by rather than a copy of classic juniper-heavy London dry gin. It's a modern Australian gin, but "not an Australiana gin," says Mackenzie. "We didn't want to be Crocodile Dundee in a bottle." So its base botanicals include native pepperberry and lemon myrtle, alongside traditional ingredients. They use other natives, including guandong and macadamia for Modern Australian Gin, and Navy Strength's finger limes. There are discussions with a property nearby looking to produce indigenous ingredients; most are currently sourced nationwide through Outback Chef. Four Pillars also uses locally sourced non-native ingredients, including grapes for the seasonal Bloody Shiraz Gin – which returns in June. "Nothing tastes like Australia," says Mackenzie, who amazes distillery industry figures overseas with samples of native ingredients such as lemon myrtle. "They can't believe that we haven't added some kind of lemon essence." He believes that Australian gin is being recognised internationally not just for its unusual botanicals, however. "They're actually world-class gins." When Chris Pratt met Scott and Vanessa Wilson-Browne at their Ballarat brewery, Red Duck, their shared passion for craft beer soon led to the discovery of a shared love of spirits too. In 2016, together with a fourth partner, they established Kilderkin at the brewery premises. The cellar door and bar also became a joint effort a year later, when the first two products were released: A Scoundrel and The Larrikin gins. As the name suggests, the latter has local character. "We wanted to do a product that captured the terrific botanicals that are available in Australia," says Pratt. He adds that, except for juniper and coriander, The Larrikin's notes are native: lemon, cinnamon and aniseed myrtles, pepperberry leaf, roasted wattleseed, rivermint and lilly pilly berries. Most other botanicals used at Kilderkin are traditional, imported spices, but the limited release Cherry Gin "was made with wonderful morello cherries from Red Hill," says Pratt. He may use other local ingredients for future special editions. The Barrel Aged Gin is matured in barrels previously containing Tasmanian whisky, which leads to a subject close to Scottish-born Pratt's heart. Kilderkin, named after barrels that hold 16-18 gallons, will release its first whisky in about two years. Just as Australian winemakers concluded decades ago that they couldn't out-burgundy Burgundy, David Vitale says we "can't out-scotch scotch," so Starward's founder and distiller is creating distinctly Australian whisky. Lately, he's also made seasonal gins (the current Autumn Bathtub Gin's botanicals include macadamia), and a bottled cocktail launches on May 7. Vitale established his business near Melbourne airport in 2007, and released his first whisky six years later. In 2016, Starward moved to larger city digs, where the lounge-bar has views of distilling equipment and thousands of barrels. He makes whisky with brewing rather than traditional distilling barley. It "creates a great platform for that distinctive Australian whisky because you're driving more flavour out ... than you normally would," says Vitale. He also uses both brewing and distilling yeasts to "get the flavour profile just right." Even more unusual, "almost uniquely in the world," says Vitale, "is that we only use wine barrels to mature our whisky." 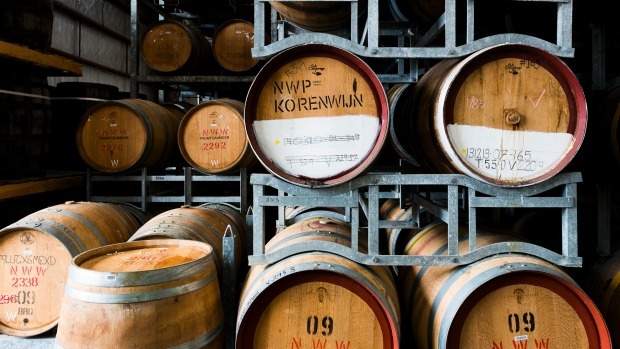 Specifically, barrels that held apera, or Australian sherry, to mature Solera malt whisky, and Australian red wine for the Wine Cask single malt. "Melbourne's four seasons in a day is a bit of a problem for ... managing fermentation consistently," says Vitale, but an advantage when maturing whisky. It "expands and contracts way more frequently than pretty much anywhere in the world," he says, so it's ready "in three years as opposed to 15, 18 or 20." This multifaceted business opened in 2016, making and serving everything from beer to cheese. In its spirits corner – quite literally, as the still's in a corner of the bar-dining area – is Sebastian Raeburn, founder of renowned Melbourne cocktail bar 1806. His first creation, Collingwood Dry Gin, includes native pepperberry and lemon-scented eucalypt. Sometimes he doesn't go far for botanicals. Eucalyptus is foraged in Carlton and Fitzroy for Anther gin, a Craft & Co incubator project for which Raeburn is co-distiller with bartender-turned-microbiologist Dervilla McGowan. "We often go round after big winds come through and see what's blown down," he says. "There's huge locational variation" in flavour, he adds, so the same species in the northern suburbs, for example, can taste very different. At The Craft & Co's farm/winery/cafe in the outer south-eastern suburb of Bangholme, native botanicals, including various myrtles, will be ready to harvest this year. Raeburn says that Australia is regarded internationally as a place to watch for gin production, because "in the United Kingdom there's about 1400 unique aromatic plants that you can distil, and Australia has more than 22,000." His local outlook is not limited to indigenous flora. During the farm's Melbourne Tomato Festival passata-making session last year, Raeburn saw the tomato waste and thought: "There's a lot of flavour in that. What can we do with it?" Make tomato-flavoured Bloody Mary Vodka. "The skill in gin is coming up with a flavour profile that's attractive and interesting," says Andrew Marks, "and as a winemaker … I'm reasonably skilled in that domain." A vintner for 20 years, Marks brought his understanding of flavours and aromas to what he calls "educated trials" in gin distilling in 2009. Three years later, he established The Melbourne Gin Company, and released his first batch in 2013. Marks says he is "making a product that tastes like gin with a twist of Melbourne." This is most evident in the native botanicals used, which he is quick to emphasise are "not tokenistic." Honey myrtle, Australian sandalwood and raw macadamias, which he buys from the Queen Victoria Market, "actually make a flavour contribution to the product. They wouldn't be in there if they didn't." Some other ingredients are locally sourced, including rosemary and grapefruit peel from his family's Gembrook Hill Vineyard, where the distillery's based (tours by appointment). There's also Gembrook rainwater, and Yarra Valley grapes. "I use grape spirit because that's what I know and I know the producers," says Marks, adding that traditional exotics including cassia bark and angelica root reflect Melbourne's cosmopolitan side.